At The BBQ Cleaner, we are well aware that many individuals out there are interested in the idea of opening up an additional stream of income. If you are tired of the daily 9-5 grind, and want to set up flexible working schedules, you may be pleased to know that we are offering a tried and tested system that can turn profitable in no time. The BBQ cleaning business opportunity in Wyoming that we are offering does not require a high start up cost. It is designed to help you get closer to financial freedom. You should know that many families in Wyoming love to BBQ outdoors. However, not all BBQ enthusiasts like to go through hassle of cleaning their own BBQ equipment that is probably full of grease and dirt. This is your chance to approach these potential customers and offer them the BBQ grill cleaning services they need. 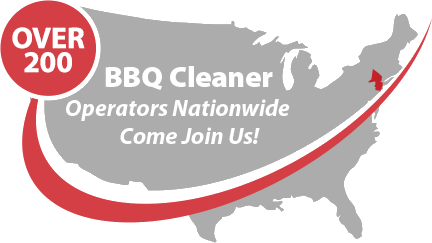 The BBQ Cleaner is looking for like-minded entrepreneurs who share our vision of bringing the best BBQ grill cleaning services to homes in the state! Why Start a BBQ Cleaning Business in Wyoming? Plenty of Sunshine: In Wyoming, there is plenty of sunshine per year. Plenty of families will be out barbequing and needing professional grill cleaning services. Potential Customers Abound: BBQ grills can be commonly found in many Wyoming You have a large pool of potential clients to serve. Unique Business: Hardly anyone wants to clean their own greasy and dirty BBQ grills. Even if they do, they might not be doing a thorough job. You can be that professional people depend on. Scalable Business: You have access to all the support and training your business needs to grow into a successful company in Wyoming. How Does The BBQ Cleaner Help You Get Started in Wyoming? We are providing on-going lifetime business support that you can access 24/7. You can get a wide range of materials, including brochures, marketing print outs, and more, from us. The BBQ Cleaner aims to be a one-stop shop for our customers and help grow their businesses successfully. You only need to focus on providing the best services to your customers. When it comes to BBQ and grill cleaning, we are a global leader that can help you maximize the earning potential for your grill cleaning business in Wyoming. Our company is established in 2009 and we more than 180 operators nationwide to date. Talk to us today to find out more about this stellar BBQ cleaning business opportunity in Wyoming!